UNITED NATIONS Israel's Prime Minister Benjamin Netanyahu (at the White House on Monday and at the U.N. on Tuesday) has one message to the U.S. and to the international community, diplomats say: go ahead and test the offer of Iran's new President Hasan Rouhani, but there is little reason to trust Iran on making its nuclear program transparent. At the U.N., during a historic week of agreements with Russia on Syria's chemical weapons and the commitment by Israeli and Palestine Ministers to restart the Middle East peace process, came the unexpected "charm offensive" by Iran's new President. In addition to the high level phone conversation of Presidents Obama and Rouhani, U.S. Secretary of State John Kerry met with Iranian Foreign Minister Javad Zarif, which was also the highest level contact on the issue of Iran since before the 1979 Revolution. Kerry also met with the Minister level representatives of China, Russia, the U.K., France, and Germany, hosted by the European Union head, Catherine Ashton. Although the talks merely set the tone for later discussion to bring Iran back into compliance with the U.N. resolutions, under the supervision of the International Atomic Energy Agency (IAEA), the resolve will be tested soon in Geneva in two weeks. That's when further talks on Iran's nuclear future will be held with representatives of Iran and six major powers on Oct. 15-16. But, what is it that Iran has promised to do with regard to the IAEA? Iran would like the sanctions imposed by the U.N. lifted in exchange for compliance with U.N. resolutions. Rouhani told the U.N. General Assembly that Iran has a right to pursue a peaceful nuclear program and a right to enrich uranium for peaceful purposes. And, indeed, that is a right guaranteed under the Non-proliferation Treaty. Yet, the reason the four rounds of Iran sanctions were put into place was because Iran was not being transparent about its programs and the mandate of the U.N. Resolutions was that Iran freeze its nuclear program until the IAEA gave it their seal of approval. At the White House, Israeli PM Netanyahu told Mr. Obama, "The bottom line is that Iran fully dismantles its military nuclear program." President Obama said: "We enter into these negotiations very clear-eyed. They will not be easy, and anything we do will require the highest standards of verification in order for us to provide the sort of sanctions relief that I think they are looking for." Former U.N. Ambassador, and now National Security Advisor, Susan Rice made clear, before the meeting, that Iran would not be permitted to continue enriching uranium. When the first round of sanctions were imposed by the IAEA, the resolution stated that Iran would have the right to enrich uranium for peaceful purposes. But because of its defiance of the IAEA, and in order to build confidence that the program was not to develop nuclear weapons, "Iran shall without further delay suspend ...all enrichment-related and processing activities..."
Whatever Iran is prepared to do to build world confidence will be tested soon. But Netanyahu is casting doubt on the sincerity of the new Iranian president. Diplomats say he is unlikely to illustrate his skepticism with something as noteworthy as a cartoon time-bomb, as he did last year. Instead, Netanyahu is likely to defer to President Obama and world powers to test the diplomatic track -- but he will make the point that any lifting of sanctions must first see results. 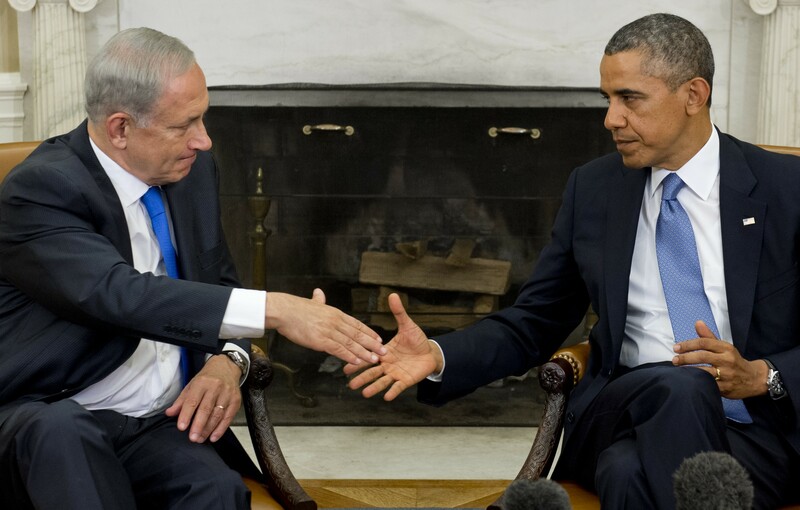 The restart of Middle East peace talks may also not be easy going. But a meeting of Israel's Minister of Intelligence and Strategy Yuval Steinitz with Palestine's Minister of Finance, Shukry Bishara, during the General Assembly debate at U.N. Headquarters seemed to lay the groundwork for what they both described as a two-state solution, which Israel's Prime Minister is sure to address as well.